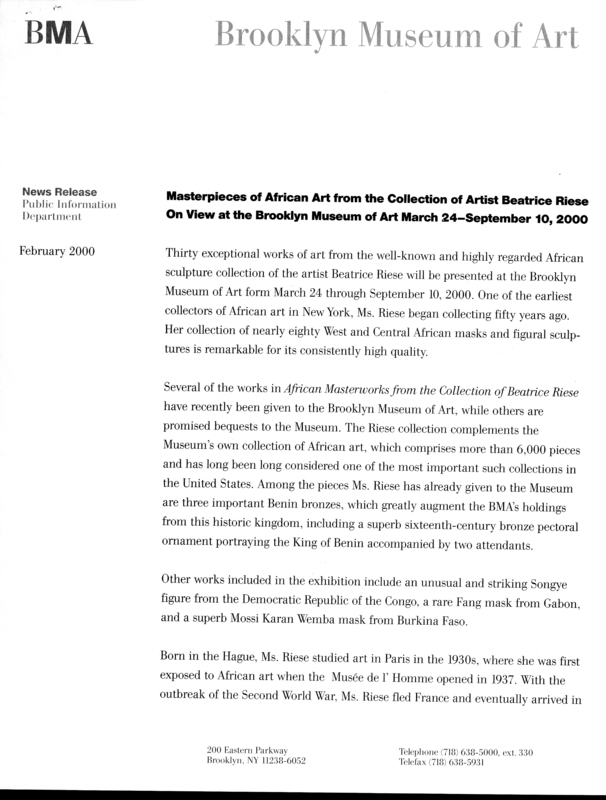 February 1, 2000 Thirty exceptional works of art from the well-known and highly regarded African sculpture collection of the artist Beatrice Riese will be presented at the Brooklyn Museum of Art form March 24 through September 10, 2000. One of the earliest collectors of African art in New York, Ms. Riese began collecting fifty years ago. Her collection of nearly eighty West and Central African masks and figural sculptures is remarkable for its consistently high quality. Several of the works in African Masterworks from the Collection of Beatrice Riese have recently been given to the Brooklyn Museum of Art, while others are promised bequests to the Museum. The Riese collection complements the Museum’s own collection of African art, which comprises more than 6,000 pieces and has long been considered one of the most important such collections in the United States. Among the pieces Ms. Riese has already given to the Museum are three important Benin bronzes, which greatly augment the BMA’s holdings from this historic kingdom, including a superb sixteenth-century bronze pectoral ornament portraying the King of Benin accompanied by two attendants. Other works included in the exhibition include an unusual and striking Songye figure from the Democratic Republic of the Congo, a rare Fang mask from Gabon, and a superb Mossi Karan Wemba mask from Burkina Faso. Born in the Hague, Ms. Riese studied art in Paris in the 1930s, where she was first exposed to African art when the Musée de l'Homme opened in 1937. With the outbreak of the Second World War, Ms. Riese fled France and eventually arrived in the U.S. in 1940. She has lived in New York since 1949 and acquired her first piece of African art in 1950, on her first visit to the gallery of one of New York’s earliest dealers of African art, Julius Carlebach. Beatrice Riese works primarily with oil on canvas as well as with pencil, ink, and gouache on paper. Her work , which has been widely exhibited, is represented in the permanent collections of forty museums, including the Brooklyn Museum of Art. For the past ten years she has served as President of the American Abstract Artists Association and she is a member of A.I.R. Gallery. African Masterworks from the Collection of Beatrice Riese has been organized by William Siegmann, Curator of the Arts of Africa and the Pacific Islands at the Brooklyn Museum of Art.